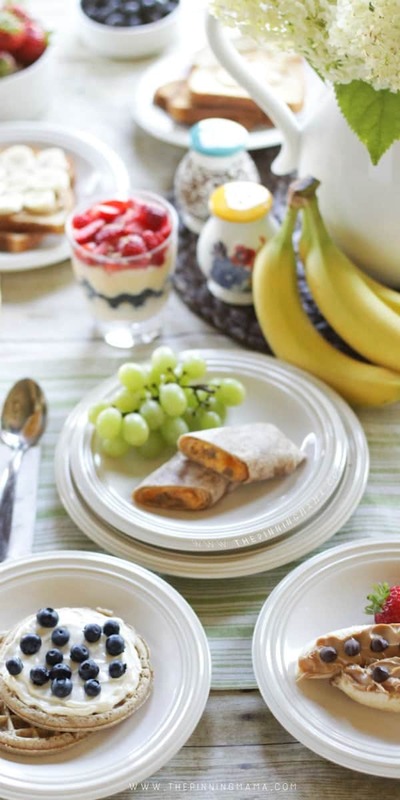 You are here: Home / Recipes / Breakfast / 6 Easy & Filling 5-Minute Breakfasts for Busy Mornings! 6 Easy & Filling 5-Minute Breakfasts for Busy Mornings! With kids it can be seriously hard to get everyone up, ready, and fed each morning. These quick and easy breakfast recipes are NOT your average bowl of cereal! They are delicious, filling, and most importantly, something you can whip up in 5 minutes or less! 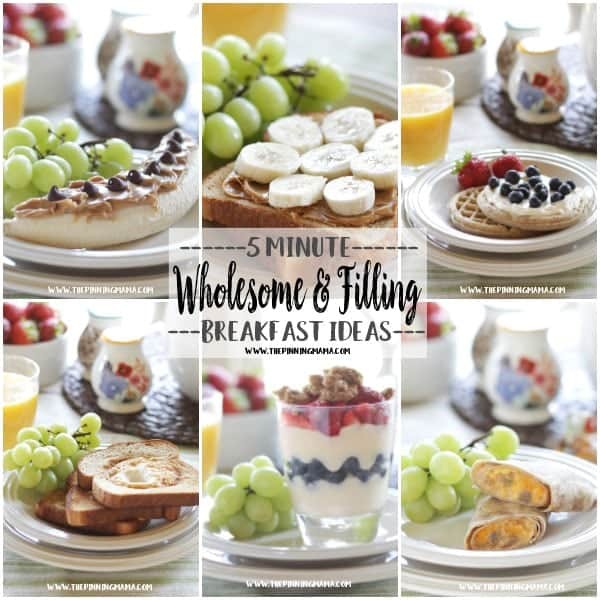 Make sure to pin this to your breakfast board on Pinterest so that you can refer back to these 6 ideas whenever you need some wholesome breakfast inspiration! Ever since I have had 3 kids, I feel like there is absolutely no time in the morning. Now that my kids are going to school, there is even more of a rush and if I am not really careful, one of the most important things gets pushed aside in the name of time and morning sanity… BREAKFAST! In reality though, my kids are just like their mother and not the most pleasant when they are hungry, so to prevent us from filling up on junk that wouldn’t keep the kids full much past the bus ride to school, I put together a little list of quick and easy breakfasts that I can make for us in under 5 minutes that are still wholesome and filling! This list of breakfast ideas will give you enough ideas for every morning during the school/work week and one extra to rotate in! I try to keep breakfast easy, tasty, and still filling by including wholesome ingredients like whole grains, fruits, and protein whenever possible. Almost all of these ideas include most if not all in each recipe. This is a favorite with my kids! They love waffles, but we can’t cover them in butter and syrup every day, so instead we created this yummy breakfast. We start with frozen whole grain waffles and toast them, then spread cream cheese over the top. Sprinkle fresh blueberries on top and either eat with a fork and knife, or if you are on the go, then just top with another waffle and eat it sandwich style! If your kids have other favorites, feel free to swap out the blueberries for strawberries, raspberries, peaches, apples, or other favorites! A few years ago, a friend of ours brought the absolute best taquitos to a get together we had. The kids and adults alike inhaled the whole tray of them in about 5 minutes flat. I had to ask for the secret recipe and when I found out they were frozen taquitos from El Monterey, we have been loyal fans ever since and frequently eat them for quick and easy lunches, dinners, and party snacks. Just recently though, I found that El Monterey makes breakfast burritos too! I knew the kids would love them since they love the taquitos so much and my favorite part as a mom is that they sell a Simply Breakfast line that is full of wholesome ingredients. I got the egg, turkey sausage, and cheese in a whole grain tortilla. I love that you can actually see each of the real ingredients in the burrito– real scrambled eggs, sausage, delicious cheese and whole grains in the fresh-baked tortilla. Quick- Check! Easy- Check! Wholesome- Check! Filling- Check! And the biggest reason, well, have you had a breakfast burrito?? YUM! This is another super simple recipe that is healthy, full of protein, and something that kids will really love eating! To make this simply use whole wheat bread and lightly toast it. Spread peanut butter on the top and then slice a banana and put the bite-sized slices on top. I find that roughly half a banana fits on one piece of toast but it can vary based on the size of the banana and the size of the slices. A couple of extra tips: If you have trouble using bread before it goes bad, store it in the freezer and it will last weeks longer! You can take it straight from the freezer to the toaster to make it easy. If you are needing breakfast on the go, this is another great recipe to eat on the run, just make it with two pieces of toast like a sandwich instead of serving open face. If you have picky eaters or kids that all want different things every time you eat then this breakfast is a hero! You can make these yogurt parfaits in no time at all, and even fairly young kids can make their own if you get out the toppings for them. It really couldn’t be any more simple, but my kids might request this more than any other breakfast. To make these up, you can use yogurt in a cup, or buy the larger quantity and just allow them to scoop it out. I prepare whatever fruit we have on hand, so blueberries, strawberries, grapes, bananas, or even apples. Then put out their favorite granola or cereal and they can assemble the parfaits by layering yogurt and fruit and then topping it with the granola or cereal. It isn’t just toast, it isn’t just an egg, it is both! Egg in a hole is the best of breakfast in a quick, easy, and portable recipe! To make this, you heat up a skillet and melt a little butter on it (or spray with cooking spray.) Use a cookie cutter to make a cut out in the middle of the slice of bread. If you don’t have a cookie cutter, you can use a knife, or an overturned drinking glass. Lay the bread on the heated skillet and then crack an egg in the center and reduce to medium heat. Let the egg cook most of the way through and then flip over the toast and continue to cook to your preference. I cook mine over hard so that we can take them on the run when we need to. Also, you can cook these the night before and then throw them in the toaster in the morning through out the week if you want something even faster for breakfast. This seems to be our go-to quick and healthy breakfast for adults and kids at our house. It is made of staples we almost always have on hand so if the fridge is getting empty, then this is always a quick and easy breakfast we can still scrape together. Besides being something we always have on hand, we just love it! The peanut butter and banana combo was pretty much a match made in heaven, and we like to add just a few chocolate chips to make it an extra fun breakfast! There are never leftovers when chocolate is involved! There you have SIX quick, easy, and wholesome breakfast options for you to make on a busy morning. If you have other simple breakfast recipes that you love, please share! Leave me a note in the comments below, or if you try them out let me know which was your favorite! « 2 Weeks of No-Sandwich Lunch Box Ideas Kids will LOVE- No Repeats! I love parfaits, but it’s been a while since I made one. And eggs in a hole – those are the best! Sometimes all you need is a reminder for all of those yummy ideas you haven’t made in awhile! Thanks for stopping by Jenn! These are fabulous ideas and just in time for back-to-school! Love the colors and the fruits! I’d love any of these for breakfast. They all look so appetizing! LOVE your ideas!!!!!!!!! Thank you!!!!!!!!! !